For the longest time, the best graphics cards have been an all-out war between Nvidia vs AMD. However, there have been rumors floating around for a while now that Intel is building a team of GPU talent to jump in on the action. In a marketplace where graphics cards are more expensive than ever, with the Nvidia GeForce RTX 2080 and AMD Radeon VII costing significantly more than their last-generation equivalents, we’re ready for a third party to jump into this war and spice up the market. If Intel approaches the GPU space targeting the same audience it does with its processors – trying to dominate the high-end, it could finally give Nvidia some real competition and force them to drive prices down. Still, we don’t know what these new graphics cards are going to look like, or when we’re going to see them. We don’t even know if they’ll ever actually exist. But, that doesn’t mean we can’t do a bit of speculation. There has been enough movement out there on the Intel GPU front to pull all the information together and try to create a kind of wish list for what we’d like to see out of Intel’s GPUs. So, keep this page bookmarked, as we’ll keep it updated with any and all information that comes our way. Intel graphics cards seem set for release sometime in 2020 and that’s the only thing we can be sure about. The chipmaker itself has stated that it’s on track to release graphics cards in 2020 at least twice. We’re not sure of a much more accurate date beyond that, unfortunately. We’re hoping it’ll come sooner at the start of 2020. 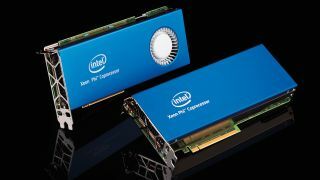 So, at GDC 2019, Intel showed off some renders of its future graphics cards. We still don’t know what kind of technology is going to be behind these cards, but it seems like Intel is on track for that 2020 release date. Coupled with Intel’s new graphics tuning software, it seems like Intel is going to slowly release GPU information over the next year. Of course, we could get radio silence until CES 2019, but we don’t think it’s going to play out like that. Either way, we don’t know the exact release date for Intel’s graphics card until the company wants us to (or until the release date gets leaked, as is likely to happen). Intel’s pricing for its graphics cards is ultimately going to boil down to what segment of the consumer market it plans to capitalize on it. We’re sure that there will be professional and datacenter GPUs that cost thousands of dollars, but we’re more interested in consumer or gaming graphics cards. If Intel decides to compete with AMD, we could see it start out with mid-range cards priced around $300 (about £230, AU$420) that give the Radeon RX 5xx series a run for its money. This could be compelling because Nvidia doesn’t have any current-generation cards in this range, and who knows what the GTX 2060 is going to cost. What we think is more likely, though, is that Intel will target the high-end and enthusiast market first — similar to what it’s doing with Coffee Lake Refresh. We could see Intel go all-in, trying to compete with the Nvidia GeForce RTX 2080 Ti or the RTX 2080, undercutting them by a couple hundred bucks and succeeding. Especially if it’s able to pack in enough traditional GPU power — we doubt that Intel will be able to compete with Nvidia Turing’s more unique ray tracing and Tensor Core-powered AI features. At the end of the day, we don’t know what Intel is doing here, but we’re excited nonetheless. We’ll be keeping our ears to the ground on this one, waiting until more information starts surfacing — so stay tuned. Usually, this is the part of the story where we dive into past releases and try to suss out what the future products are going to look like. But, we can’t really do that this time around – it’s been almost two decades since Intel has released a discrete GPU, and that didn’t end so well for team blue. So, instead, we’re going to dive into some speculation based on Intel’s teaser video and a bit of what’s going on in the scene these GPUs will be entering. In Intel’s teaser, wherein it claims to ‘set your graphics free’ – whatever that means – Intel reminds us that it not only created the first GPU capable of handling 4K Netflix, but also the first fully DirectX 12 compliant GPU and a gaming PC that’s ‘as thin as a phone’. And, with these claims, and considering the talent it’s poached, like ex-AMD graphics guru Raja Koduri, it looks like Intel is going to try and push the envelope a bit. Whether that means it’ll support fancy rendering techniques like Nvidia is with the RTX cards, we don’t know, but Nvidia could certainly use some competition at the high-end, and we might see Intel make a run for it. Intel is taking some notes from its competition, too. At GDC 2019, Intel launched the new Intel Graphics Command Center, which is the Blue Team’s equivalent to something like Nvidia’s GeForce Experience. This isn’t especially helpful right now, as integrated graphics aren’t the best for playing games, but it does mean that once Intel graphics cards do release, they’ll feature one-click game optimization. At the end of the day, there are only a couple things we need to see in these new GPUs, they need to be capable of 4K gaming, and they need to be priced competitively. If Intel is able to hit these two marks, we could see Intel competing in the bloodthirsty GPU marketplace. But, we won’t know until Intel is ready to share.